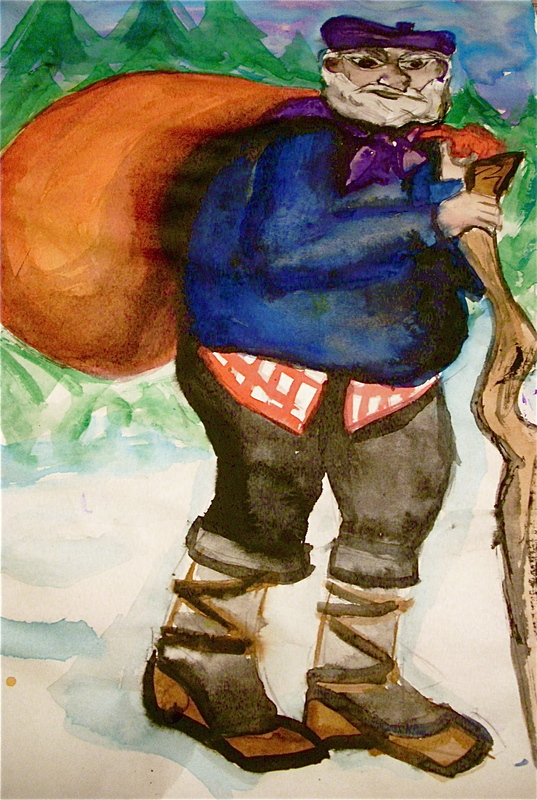 A Christmas character from Spain’s Basque Country, Olentzero is sometimes said to be the last member of the “jentillak”, a mythological race of Basque giants that inhabited the Pyrenees before the coming of Christ. Other versions of the legend have him abandoned in a forest as a babe, found by a fairy who left him in the care of an older childless couple. After perishing in a fire to save some children, the fairy came to his rescue again and granted him eternal life. Since then he has hung out in Euskal Herria (the traditionally Basque homelands, including present day Basque Country, and Navarre) spreading Christmas joy among children and adults alike. Following the Franco dictatorship during which all aspects of Euskadi culture were strictly oppressed, the Olentzero traditions were revived as an alternative to the Spanish tradition of the Three Wisemen. making sure every Basque child gets a gift at Christmas. Every December 24th he hikes down the Pyrenees mountains to the villages below them to deliver wooden toys he makes himself. Perhaps you think video games and battery-operated toys are the best gifts? You might be surprised. Many years ago, when I was small like you, Olentzero gave me a toy, a puppy standing up on its hind legs carved in wood. Look, I have it still, keep it in my pocket for luck. When I take it out it’s face spreads in a doggy grin and it laughs a barky laugh as it dances across my palm. No batteries or electrical outlet required. Even as I tell you this story, Olentzero is stomping through the forest, knocking snow from tall trees, and then brushing it off his shoulders, dodging tree branches and building an appetite, perhaps occasionally stopping to twitter with the birds and chatter with the beasts, carving and whittling their likenesses in wood. Like so many giants, Olentzero is tall and thick with a huge appetite. On his Christmas Eve trek around Basque country, up and down the mountains and across the valleys between, his hunger grows and grows. Fortunately, the villages expect him and his appetite, and we always prepare him a snack. I’ll never forget the year I saw him eat three foot-long chorizo sausages on three loaves of bread with three dozen fried eggs, washed down with a gallon jug of cider in a snap of finger-thumb or less. My friend Oihana in the next village over says she saw him gulp down two roast chickens, bones and all, two bottles of txacoli wine and a huge skillet of rice. Just wait and see, watching him eat is almost as amazing as watching him chop firewood, or make toys but you can’t turn away for even a moment, because centuries of practice makes more than perfection, it makes speed. Here he is. See the tall man with the white beard and the worn out beret, angled to one side? See the big red sack slung on his back? Look, he’s set it down. Take him this egg sandwich. I made the potato omelet myself. 12 eggs, six big potatoes and one yellow onion in it: stuffed into a big round loaf of bread. Run along now. I promise he won’t bite. Don’t forget your smile and your please and thank you, giants appreciate manners too.